"Thank you!! I know owners are partial to their own dogs, but Sasha really was a majestic dog. I have watched my family roll their eyes at me because this urn means so much to me. They think I am a wacko!!!!!!!!!! 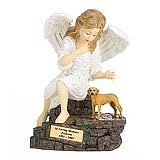 I feel sorry for people that never knew the love of a dog as much as I do and want to commemorate their lives to us forevever!!!!!!!!!" 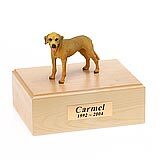 All available Rhodesian Ridgeback dog urns and memorials will be displayed with the figurine on the Rhodesian Ridgeback urn you select and in the appropriate size.